News flash, I’m a parent. A parent who has struggles and dreams and fears and joys just as every other parent does. I am a parent who has a strong willed yet sensitive young lady to raise. A young lady who often bursts with confidence one moment and then shrinks back into herself the next. A young lady who one moment knows her strengths and her smarts and the next feels less than. I am a parent raising said young lady with three other adults as a blended family and with a community so large and vast that I feel sometimes I’ve lost all control. I am a parent who likes to feel a sense of control. I am also a parent who reads voraciously and often reads about raising young children to adulthood. I know how to love my young child fiercely, but I don’t have all the answers so I seek to read and learn, learn and read. Enter: The Self-Driven Child, The Science and Sense of Giving Your Kids More Control Over Their Own Lives. I could not set this book down… Let me just say this right here… If you have a child in your life; whether you are a parent, aunt, uncle, teacher, coach, counselor… whoever you are, you impact the children that touch your life, so I suggest you read this. Seriously, it is that profound. I will be re-reading this book throughout the next 10 years and referencing this book into adulthood. There, I said it. It is that impactful and has that many tiny little ah-ha moments, it just needs to be a guide book to helping little ones get to adulthood for us responsible for helping them get there. The premise; allow kids to make more of their own decisions. Simply said, easily proved within the writings, definitely hard to implement. Our young lady has such strength and courage. She is wise and witty and completely whip smart. There are times she knocks me over with just how quickly her mind works. And if you’ve been reading this blog for any time, you also know she struggles in the box that is the school setting. We have had many fights about homework and school work and focus and commitment to doing good work and simply trying. 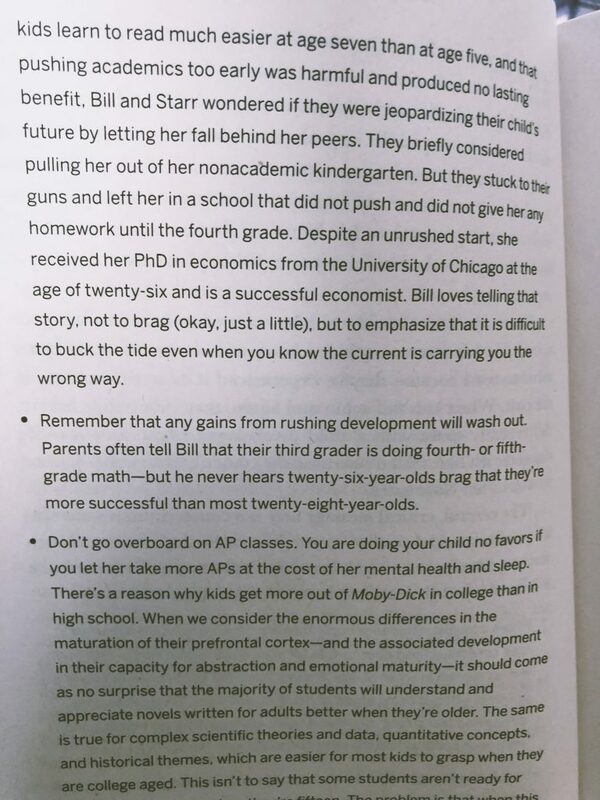 News flash, according to this book, I have failed my child. I am a-ok to learn that and make adjustments. In parenting it is difficult to not make comparisons. I compare myself as a parent and of course I compare my children based on their progress to others. In this social world where parents often post about how spectacular their kids are, how “gifted” their children are, how smart their 8 year old is; it is hard not to feel like a failure sometimes. I am often hanging on by the proverbial parenting thread and trying to just get my kiddo to focus for 30 minutes on math. But, this book right here, it levels the parenting playing field. First, by removing airs about progress. The excerpt above says all we need to know. 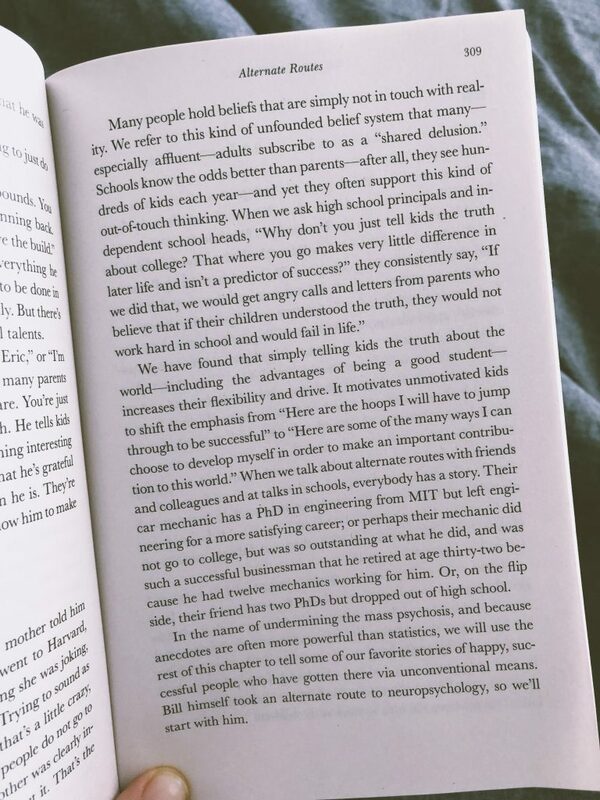 “Parents often tell Bill that their third grader is doing fourth- or fifth-grade math – but he never hears twenty-six-year-olds brag that they’re more successful than most twenty-eight-year-olds.” Ta-da, life is an equal playing field and over time we all successfully get to where we are meant to be and belong. Parents need to breathe through these kiddo years more and ensure that we are not putting false pressure on our beautiful littles to be anything but who they are meant to be. You keep bragging about your smart kid because I am going to keep bragging about my funny, creative, loving kid. The world needs both. In our house we have implemented the art of choice quite a bit since reading this book. I started with a short leash because our young lady is 8 and I struggle with losing control. So instead of giving her the option of doing or not doing her homework, I have let her decide when to do it. For example, now or after dance. And by simply letting her make the choice of when, all fighting and whining has stopped (when she’s tired or hungry there are still challenges, but progress). I have also implemented “Mommy Office Hours”. This is a timeframe set for me to consult on homework while she is working. I check the clock and round to the next hour. If she starts at 4:05pm, she gets 55 minutes of consulting. If she starts at 4:45pm, it’s 15 minutes. Setting office hours has inspired focus on her part and an urgency to tackle the work she struggles with. She knows that during that time frame I am 100% available to her when she asks for help. Outside of that time frame she is on her own. Setting office hours has inspired more focus, she takes more control over her own work and we have moved from a time and place in which she hoped for me to support in/do all of her work to a time and place where “she can do it all on her own”. Our world has become exponentially more calm and more inspired since implementing choices. Giving our Doodle power over decisions she is making for herself has lead me as a mom to enjoy parenting more. If the decision isn’t life threatening or financially impactful, it’s on her. If her life could be in danger or financially the decision is unproductive, we discuss power and control. Giving Doodle choices has lead to an increase in self awareness, confidence, kindness, effort at school and around the house and ultimately joy for our girl. It’s just that simple. I could go on and on, but the bottom line is that The Self-Driven Child will support any parent in the journey of parenting a child into a confident adulthood. The structure of this book provides every parent the opportunity to meet them where they are at in their parenting journey. You’ve got a baby, great there’s a chapter on that. Eight year old, cool, they have that covered too. High schooler, no fret, there’s help for you too. College student or early adult hood, sure, read on, they’ve got something in here for you too. The Self-Driven Child helps parents through every stage of parenting and we all know, parenting never ends. We love our children fiercely until we are not here to love them. 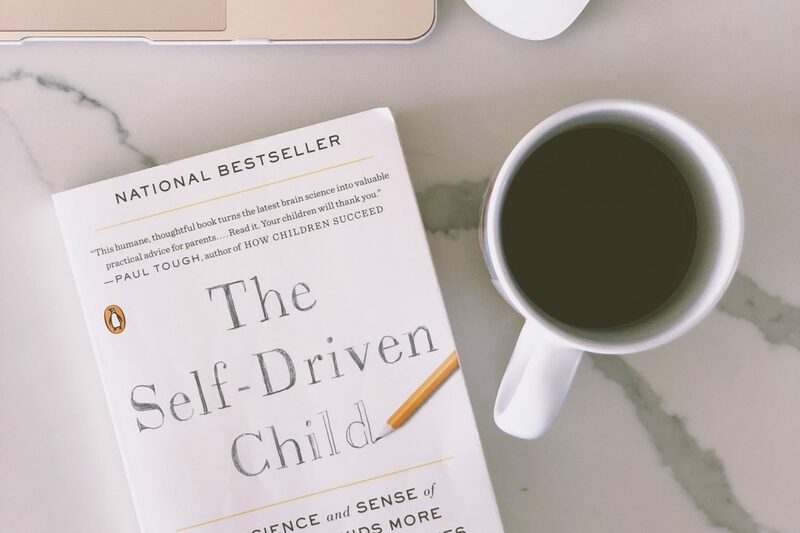 If you’re a parent like me who just wants a little help getting it right, read The Self-Driven Child. It’ll help you. I promise. We all extrapolate different nuggets from the same world. We all will extrapolate different nuggets from this book too. But, it’s never wrong to have a few more golden nuggets to help in the raising of young humans. Read it, let me know your thoughts. Want to know what I’m reading next? Follow me on GoodReads.